Can an unlikely romance return the magic of Christmas to an entire town? All podcaster “Cheery Charlee” Ridgeway wants for Christmas is to land her one-millionth follower. But first, she needs a really good story. Amid hundreds of submissions, one stands out: a plea from Cape Sunset, a small fishing village that hasn’t celebrated Christmas since Jack Fortner lost his fiancée four years ago. It’s the perfect pitch, but who knew Jack would be such a downright Grinch—or so heart-stoppingly handsome? Jack’s comfortable crab-fisherman routine is shaken when Charlee blows into town with bells on. It’s not long before the pretty podcaster is breathing new life into Cape Sunset, captivating everyone—including Jack, who’s feeling things for Charlee he once thought he’d never feel again. Not that he shows it. Despite Jack bah-humbugging her every move, the show must go on. But the closer Charlee gets to Jack, the more growing her audience is the furthest thing from her mind. Thankfully, Jack has a few surprises waiting under the tree… including a love that will last a lifetime. A cute story about two people who refuse to celebrate Christmas. One, because it brings back too many sad memories and the other because she's too busy granting other people’s Christmas wishes. Jack lost his fiancée suddenly four years ago during the town's annual Christmas parade. Blaming the holiday festivities, he petitioned the town council to cancel the parade and all outward signs of the holiday. Now, out of respect for him, the town as a whole does not acknowledge the day, but in private Christmas still lives. Charlee is alone in the world, except for her friends. She likes bringing cheer and goodwill to others during the Christmas season and this year, it’s to bring Christmas back to Sunset Cove. She starts slow by putting up a few decorations here and there and will end it with a huge Christmas Ball. Except that she's running into opposition from Jack. Just the sight of the decorations causes him to confront the day his Jenny died in his arms during the parade. Charlee doesn't mean to cause Jack more pain, but rather wants him to deal with the emotions he's feeling and learn to accept that there is nothing that he could have done to save Jenny that awful day. And then there is the attraction that they have toward each other. Does letting go of the past mean that Jack doesn't love Jenny anymore? Does accepting Jack to always be there for her mean that Charlee has to let go of her fears of being alone? Two people have a lot to learn if they really want a Christmas miracle. This is a really enjoyable, perfect for getting you in the Christmas mood romance. It is a lovely story of ignoring-one's-past meeting up with refusing-to-move-on, and realising that there is a place of common ground. It works because both characters have flaws and whilst they wear their mantles of choice well, we get to see their foibles too. Clearly two attractive, intelligent, and lovable beings, one has earned the respect of the town; the other comes in and charms it out of the locals. I enjoyed very much the mixing of modern podcasting to earn a living with a town which relies on fishing to keep it alive. If you only read one Christmas book this winter, you will not regret choosing this one. As an avid reader, Mary Shotwell always fantasized about writing a book. Throughout her childhood in northeast Ohio, she wrote poems and short stories as a hobby but ignored the call of writing to pursue a career in science. After studying dolphin behavior and great white shark populations, she earned her Ph.D. in Biostatistics in Charleston, South Carolina. It was there, during the arduous dissertation process, where she had the idea to write a book. Creative writing served as a natural escape from technical writing, wedding planning, pregnancy, and job hunting. Mary studied dolphin behavior in North Carolina and estimated great white shark populations while living in Cape Town, South Africa. She earned her Ph.D. in Bio-statistics in South Carolina, winning several regional and national outstanding student paper and presentation awards. It was during the arduous, laborious, grueling, “she-didn’t-know-she-could-learn-to-dislike-science” dissertation process that she decided to write a book. And the calling could not be suppressed. Christmas Catch is Mary’s debut romance novel (Carina Press, 2018). She loves incorporating her science and nature background into unique small town romances. When adulting, she’s a wife to husband, Matt, and mother to three dragons, sometimes referred to as children when nothing is on fire. 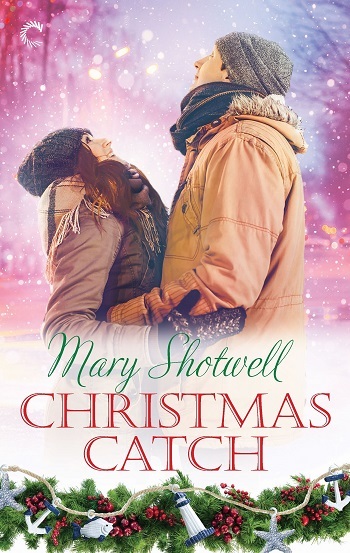 Reviewers on the Wicked Reads Review Team were provided a free copy of Christmas Catch by Mary Shotwell to read and review.